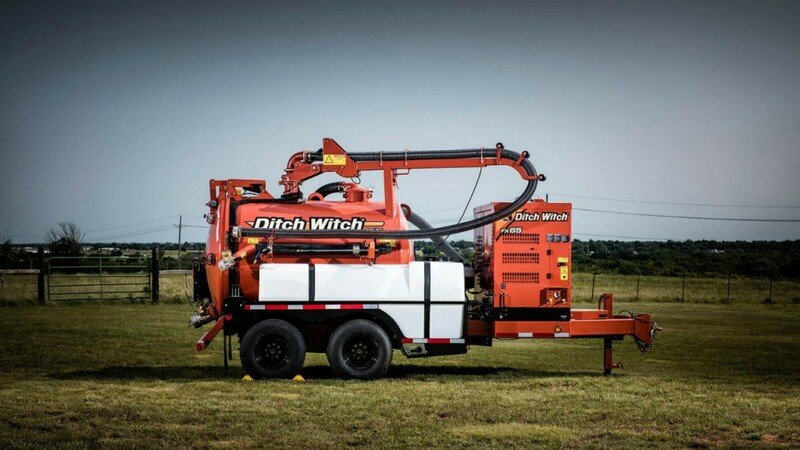 Ditch Witch enhanced its lineup of vacuum excavators with the trailer-mounted FX65 and truck-mounted FXT65 models for increased productivity on the job site. Turbocharged with a 74-hp (55-kW) Deutz Tier 4 diesel engine and 1,215 cfm (34.4 m3/min), these units are designed to optimize airflow for the highest performance output. Offering exceptional suction and water pressure, the vacuum excavators can handle sizeable cleanup jobs, larger excavations and potholing. In addition, an auxiliary hydraulic power system enables a variety of tools from impact wrenches to jackhammers. The FX65 model is available as a trailer-mounted unit. The FXT65 is integrated into a truck chassis. These versatile systems are equipped with excellent water excavation capabilities, and a high-powered air excavation system is also offered on the FXT65 Air model. Further improving versatility, tank options for the trailer-mounted FX65 include 500-, 800- or 1,200-gallon vacuum tanks and 200-, 300- or 500-gallon water tanks. Tank options for the FXT65 truck vacuum include 500- or 800-gallon vacuum tanks and 200- or 400-gallon water tanks. The truck-mounted FXT65 provides power in a compact package, increasing mobility and maneuverability on any job site. These units lead the industry in quiet operation at 82 dBA. A larger silencer further reduces noise for minimal disturbance in noise-sensitive areas and improves operator comfort. In addition, the machines offer several optional features – such as wireless boom, water heater and reverse flow – to meet the needs of a customers’ ever-changing job site. The FX65 model is available as a trailer-mounted unit. The FXT65 is integrated into a truck chassis. The truck-mounted FXT65 provides power in a compact package, increasing mobility and maneuverability on any job site. The new McElroy Acrobat 315 is helping meet the demand for larger polypropylene pipe fusion capability up to 315mm (12") while offering low- and high-force options for polyethylene pipe. The compact, lightweight machine caters to the HVAC, plumbing and mechanical industry as well as the underground/construction world. It functions as easily indoors in tight work spaces as it does outdoors in the smallest trenches. Large underground projects such as rapid transit tunnels are today being built through highly congested areas, both above and below ground. One of the most complex challenges involves accurately locating existing utilities during the design phase and discerning whether the utility can be accommodated or if it must be relocated. The Vermeer MEGA VAC VXT truck series by McLaughlin is a highly productive vacuum excavator designed to meet increasingly strict weight restrictions and regulations. Ideal for utility and distribution contractors, the VXT Series is a reliable, cost-effective solution for high-production potholing crews. The new 6-inch (15.2 cm) PTO-driven series comes in three standard spoil capacities ranging from 1,200 to 2,000 gallons (4542.5 to 7570.8 L). The VXT series is powered by the industry-proven OMSI Gearbox and a ROOTS 3200 CFM (91 m3/min) blower. The new CAN Control system allows for two-way communication between the remote control and the vacuum excavator, which helps contractors increase jobsite productivity. The new Vacuum Neutral feature allows the blower to breathe free air and stop suction without the need to close the hydraulic gate valve in the boom. The McElroy TracStar 1200 fuses pipe from 16" OD to 48" OD (450mm to 1200mm) bringing the largest pipe fusion capability to its line of track-mounted machines. Upgrades include an advanced emission control engine that burns ultra-low-sulfur diesel to meet US EPA Tier 4/EU Stage IIIB standards and the ability to upload joint reports to the DataLogger® Vault™ for storage and analysis. A redesigned cowling and rearrangement of internal components allows better access to the engine for maintenance. Other features include hydraulic outriggers for machine stability and leveling, an ergonomic operator platform and remote engine stop/start capabilities. Con Cast Pipe, a manufacturer of precast concrete drainage products including concrete pipe, manholes, catchbasins, and box units, as well as a wide range of bridge and specialty precast products in Canada, has announced the recent purchase of Hy-Grade Precast Concrete in St. Catharines, Ontario. Due to their outstanding reputation in the Niagara community, Hy-Grade Precast Concrete will continue to operate under the Hy-Grade name and become the third Ontario manufacturing facility for Con Cast Pipe. Micro Trenching is one of the installation methods being utilized by contractors to bring fiber networks to consumers. Micro Trenching is an installation method in which a narrow and relatively shallow trench is cut, usually on an asphalt roadway. Trench dimensions can range from .75 to 2.24 inches wide and 8 to 16 inches deep. While cutting, a vacuum system connected to the cutter wheel cleanly diverts and transports debris away from the worksite. Once the conduit is laid, the trench is backfilled with a grout compound. Advantages of Micro Trenching include minimal cutting width that boosts installation production, reduce costs of backfill, shallow depth placement which helps avoid encounters with existing utilities and jobsite cleanliness thanks to the vacuum spoil that removes debris. Advanced Drainage Systems, Inc. (ADS) (NYSE: WMS), a leading global manufacturer of water management solutions, today announced its latest breakthrough in storm water pipe technology, HPXTM 75. This new technology provides heightened levels of stiffness, is available in a range of sizes, and yields significant cost benefits for customers compared to alternative products. Ditch Witch has introduced the construction-grade SK1050 mini skid-steer, ideally suited for a variety of demanding landscape, hardscape and irrigation jobs. The unit improves versatility and productivity by directing more hydraulic power to the attachment. Vac-Tron Equipment is introducing a new line of vacuum excavation equipment. The new CV (Competitive Vac) Series offers the performance customers expect from Vac-Tron Equipment while keeping the cost of operation to a minimum. McElroy announces the launch of a new series in its long-proven TracStar line that is more functional and efficient than ever before. TT Technologies recently introduced a new cutterhead configuration for its Grundoburst static pipe bursting system. The new configuration consists of three specially designed bladed, roller cutterheads in succession. The bladed roller cutting head configuration allows contractors to burst/split large diameter steel and ductile iron pipes when used with larger Grundoburst static bursting systems. The new special cutterhead design allows for a smoother host pipe cut and greater protection for the new pipe. Vac-Tron Equipment is on a roll. Only one year after releasing their very first HTV (Hydro Truck Vac) PTO, they are now introducing their NEW JTV (Jetter Truck Vac) PTO series. The JTV 873 PTO is a new series of PTO truck driven systems that combine vacuum excavation with high pressure jetter capabilities putting this truck in a league of its own. MSA XTIRPA confined space entry systems allow for vertical or horizontal entry into common confined space applications such as tanks, vessels, transformers, sewers and manholes. Three new, turbocharged utility tractors from Ditch Witch give operators the power to get jobs done more efficiently and with greater comfort. The population growth of the Town of Milton, Ontario in recent years has been phenomenal. With the province’s Places to Grow legislation, this growth is expected to continue for many years. The Boyne Trunk Sanitary Sewer was identified in the Halton Region’s Wastewater Master Plan as being critical to convey existing and future flows to the Mid Halton Wastewater Treatment Plant in Oakville. The existing sewage pump station and force main conveying sewage from Milton was at its maximum capacity. The commissioning of a new major trunk sewer to replace the existing system and to convey future flows from the northern part of the region was of critical importance. In order to balance the needs of growing the Region of Halton with the protection and preservation of its natural and heritage resources, Halton initiated Sustainable Halton which developed goals that serve as a blueprint for building a sustainable and healthy community. The need to upgrade the existing wastewater network to service future intensification in Oakville’s Urban Growth Centre was identified as part of the process. When an old storm water sewer that crossed below a highway and a highly frequented shopping avenue in the City of Quebec partly collapsed and had to be replaced, the city government was presented with a challenge. The solution required a method to renovate the pipeline while keeping traffic disruptions to a minimum. McLaughlin has introduced the new ECO truck-mounted vacuum excavator series to answer the market’s demand for a compact vacuum excavation system that focuses on performance and improved fuel efficiency. Powered by 49, 85 or 99 horsepower (37, 63 or 74 kW) auxiliary engines, ECO Series vacuum excavators offer utility contractors fuel economy, lower operating costs and reduced maintenance. With the ability to choose from 500- to 1200-gallon (1892.7 to 3028.3 L) spoil tank capacities ― and the ability to mount ECO Series units on both new and used truck chassis ― contractors can customize the truck vacuum excavator to their specific needs. Geopolymer is a term originally coined by French researcher Joseph Davidovits to describe a class of “cement” formed from aluminosilicates. While traditional Portland cement relies on the hydration of calcium silicates, geopolymers form by the condensation of aluminosilicates. Geopolymers are known to provide comparable or better performance to traditional cementitious binders but with the added advantages of significantly reduced greenhouse emissions, increased fire and chemical resistance, and reduced water utilization. On Eastlawn Street in the City of Windsor, Ontario, heritage homes on double lots with mature trees beautifully line the narrow street. Not so beautifully, white sewer access caps dot the lawns of more than half of the homeowners. It is a telling sign of the ongoing battle between concerned homeowners and the roots they cannot see underground. A new 9-metre manhole installed as part of Edmonton’s massive project converting the QE II Highway and 41 Avenue SW connection to a grade-separated interchange. Six failing manholes in remote Carmacks, a Yukon village. Available exclusively on the Camel 1200 sewer cleaner, Super Products LLC’s wastewater recycling system features a six-stage water filtration process that enables effective sewer cleaning action without the need for fresh water. And this capability can translate into substantial water, time and money saves for municipalities and sewer contractors. Doetsch Environmental Services recently used its proprietary Hyjector system to complete the company’s longest-ever single-run sewer-cleaning project. It’s no secret that trenchless technologies can offer big cost savings over open-cut excavation. What gets less play is how skipping the big dig can pay off in lower greenhouse gas (GHG) emissions, too. McElroy has launched a new machine in its flagship TracStar series that offers advanced emissions reduction and automation technologies allowing users to meet today’s toughest regulations in air quality and data logging. Trimble has announced the latest version of its smart water mapping and work management software—Trimble Unity 3.0. Trimble Unity is a cloud-based, (GIS) centric software-as-a-service (SaaS) solution for smart water management. Version 3.0 includes new features and workflows and also offers an App Builder and new integration capabilities to simplify connecting mobile workers with maps and data from back office enterprise systems. Ditch Witch has introduced a new line of air excavators: the FXT30 Air FXT50 Air, and FXT65 Air. The versatile and high-powered FXT Air system has air and water excavation capabilities, making it ideal for locating utilities or gas leaks in below-grade worksites. Ditch Witch will be showcasing innovative equipment designed to help global, underground construction operators be more productive and confident on the job at the 2016 Bauma event. Customer-driven equipment will be on display in Ditch Witch Booth B3-412 at the international trade fair centre in Munich, April 11 to 17. When cold weather conditions set in, regular maintenance and a heightened awareness of how to keep vacuum excavation equipment operating properly is required to avoid costly repair expenses. In the oil and gas market alone, there are thousands of vacuum excavators at work in oil fields across North America, and a majority of these units are working through the winter in extremely cold conditions. Often seen as the workhorse of the underground construction industry, the hydro-vacuum truck is almost ubiquitous in its presence on most jobs involving the removal of dirt and debris from underground utilities. Whether it’s potholing to expose buried facilities, sucking up drilling fluid during an HDD project, or custom-fitting a hydrovac truck to perform sewer cleaning operations, the diversity of applications available to a hydrovac make it an indispensable piece of equipment for a utility contractor to own or rent. The Toro Pro Sneak 365 Vibratory Plow delivers powerful plowing in a compact, maneuverable package perfect for installing drip irrigation lines, electrical cable or other utilities in tight spaces. Utility contractors appreciate the narrow tire configuration of the Pro Sneak, which spans 36” in width, allowing for passage through gates, or other obstacles. Also available on the new Pro Sneak 365 is the dual-tire option for increased traction in challenging ground conditions. Vermeer has introduced the dedicated FTX25 footings trencher – a stand-on, track-mounted trencher built to dig footings up to 26 inches (66 cm) deep and up to 12 inches (30.48 cm) wide for residential concrete slab installations. 2015 was a game changer for the grouting industry, US Grout, LLC and Avanti International. As of this year, US Grout's Ultrafine SD and Ultrafine ND Cementitious Grouts - solely distributed by Avanti - are now certified by NSF International as conforming to the requirements of NSF/ANSI Standard 61 - Drinking Water System Components - Health Effects. In other words, Ultrafine SD and ND are certified for use in contact with potable water. Since the early 1940s, NSF International has developed standards, tests and certified products and systems to protect and improve global human health. For engineers and contractors, this is a differentiator. In Canada, the quality of drinking water that flows from the taps of most households is for the most part taken for granted. While the country has pockets of populations with water quality concerns, Canadians generally regard their drinking water not only as safe, but of a higher quality than other developed nations. Civil engineers could be looking at London as a template for hard-to-access sewer cleaning jobs. The Ontario municipality recently installed three specialized manholes with sealed access flanges into one of its longest and oldest sewers in order to clean the pipe, after a camera probe two years ago identified it as being partially filled with solids and grit that would eventually restrict flows.